Romantic date activity? Visit the supermarket, check! Meanwhile, Gong Ming locks up all of his stuff again and goes back to 16 B.C. He is beginning to suspect that Wang Mang is plotting to have him killed. He isn’t wrong, because Wang Mang orders Zi Xiu to somehow cause Gong Ming to die accidentally so the pendant would not be able to do anything. Wang Mang is still fuming with anger over the whole Ying Yue thing. 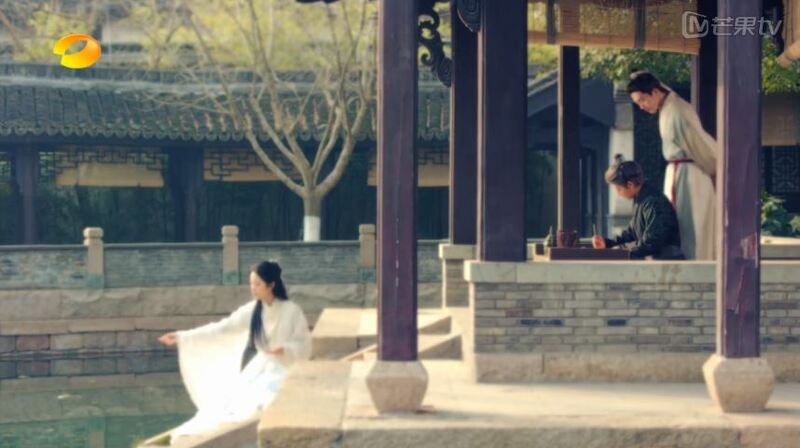 In a flashback we see Wang Mang writing a poem for Ying Yue, but is too embarrassed to show her. Teacher Zhang chides that Ying Yue should get married soon and asks Wang Mang what he thinks of the Gong Ming/Ying Yue pair off. Out of bitter jealousy, Wang Mang comments that Ying Yue’s low family status makes her unsuitable as Gong Ming’s wife. This hurts Ying Yue as she runs away with Gong Ming chasing after her. 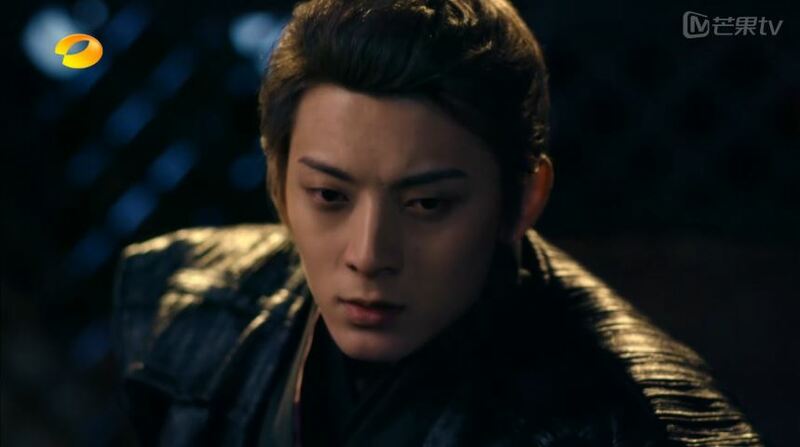 Now that Gong Ming is back, he confesses to Ying Yue his suspicions about Wang Mang, and that all his memories came back. 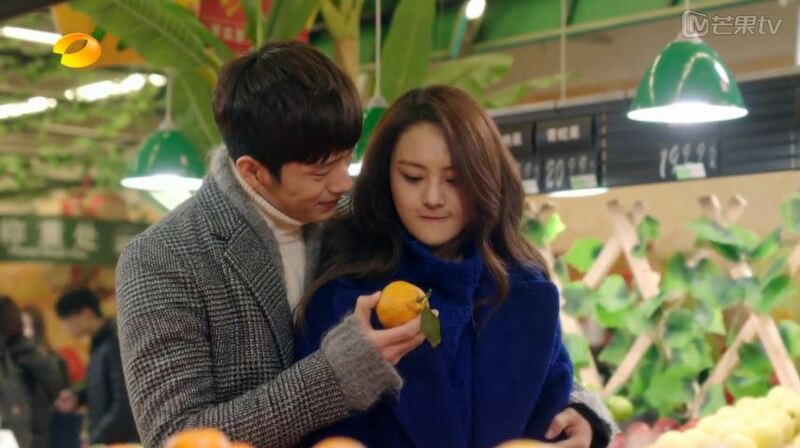 Ying Yue tells him that they should forget about the proposal because they have been like siblings all these years, so she is already plenty satisfied. Awww, Ying Yue!!! Back in 2015, Xiang Xiang meets with Yu Fei on the rooftop. 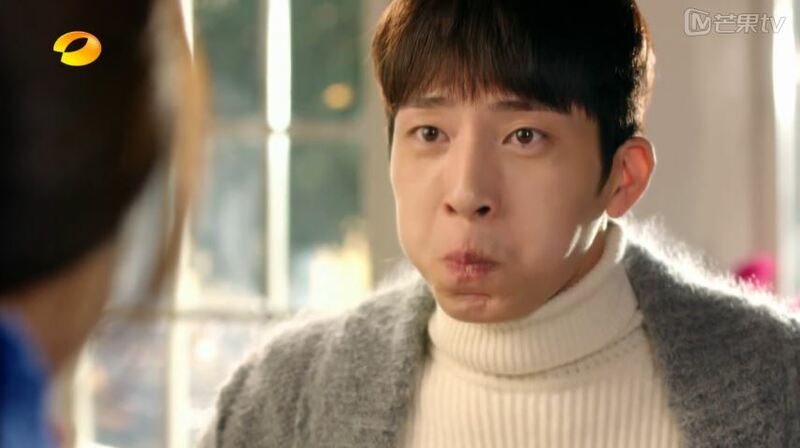 He solicits a kiss from her for getting the best actor’s award, and her response? “Let’s breakup.” Dang. Girl, you cold. Yu Fei wonders if she is still thinking of the man in her hallucinations, and she says that Gong Ming is real. He tells her that he is going to pretend like she didn’t bring this up and leaves to go back to his celebratory party. can someone give this dude a kiss? Xiang Xiang doesn’t go to the party. 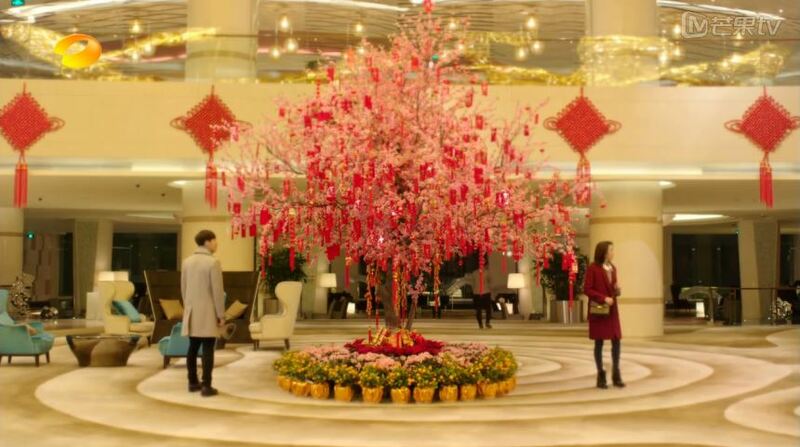 Instead she is in the lobby looking for Gong Ming, who is playing hide and seek with her. The dramaland peripheral vision has infected Xiang Xiang! She doesn’t see him even though he is like right there. Literally, right there. 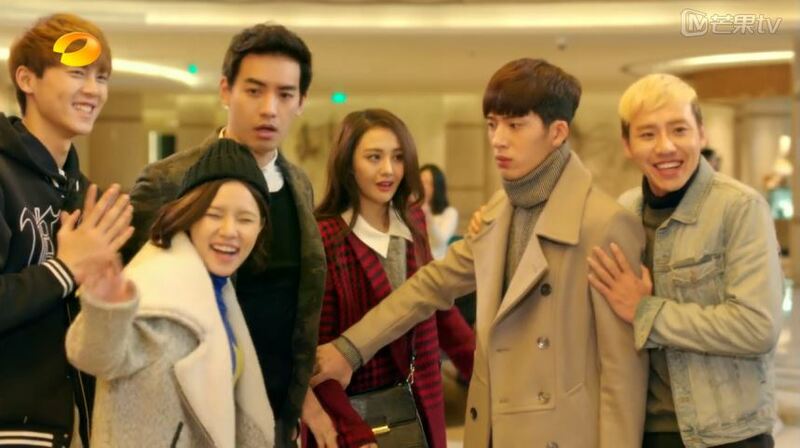 As the two hold hands to walk away, Yu Fei calls out after them to demand an explanation. Suddenly there are reporters everywhere and an awkward moment ensues as everyone pretend to be friends and smile at the camera. At least this is better than the other time at the airport. ha-ha, nothing to see here, we are all buddies! Back at the bar, Yu Fei tries to get the story straight from Xiang Xiang. 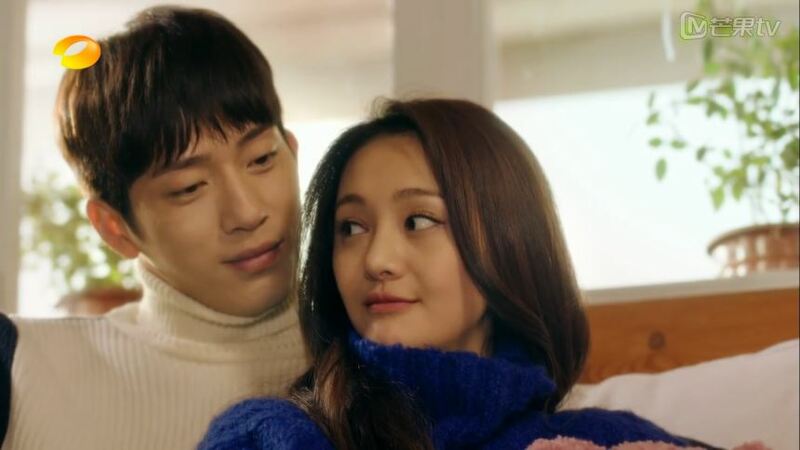 She claims to have been with Gong Ming this whole time, and he asks if that means she was cheating on him. Things get more confusing because no matter what Xiang Xiang says, so Gong Ming tries his hand at explaining. Of course, it doesn’t get any better because Gong Ming just emphasizes that him and Xiang Xiang are returning to their original relationship which makes no sense to Yu Fei. Yu Fei finally resorts to gambling and drinking to resolve this “battle between men.” He mocks Gong Ming for not drinking and Gong Ming replies that drinks here are too strong. Dude, Rio? It’s just cocktail. You can do it! Maybe Gong Ming didn’t need to know how to drink after all because he is winning at this dice game! Yu Fei tells Gong Ming to go find someone else, and Gong Ming throws the statement back at Yu Fei because Yu Fei cheated on Xiang Xiang before anyway. 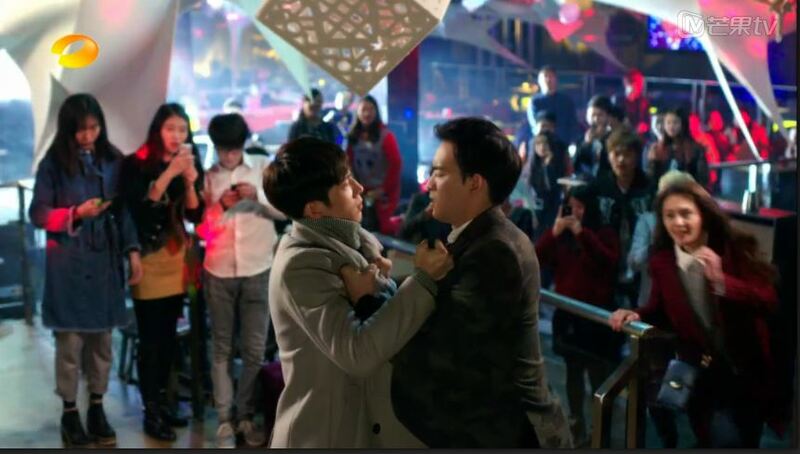 Yu Fei throws a punch at Gong Ming and things get serious as people start to take photos of them entangled together. After leaving the bar, Xiang Xiang asks Gong Ming to stay for the night. So they wake up next to each other in the morning… Uh, wait, did they…? Or didn’t they…? Well, either way, they spent the night together in some shape or form. While Xiang Xiang is still deep in sleep, Gong Ming walks around her house looking at her childhood photos. Soon after, she wakes up they put on an old Theresa Teng record, cuddle up on the couch and flip through her album together as she tells him about her family. 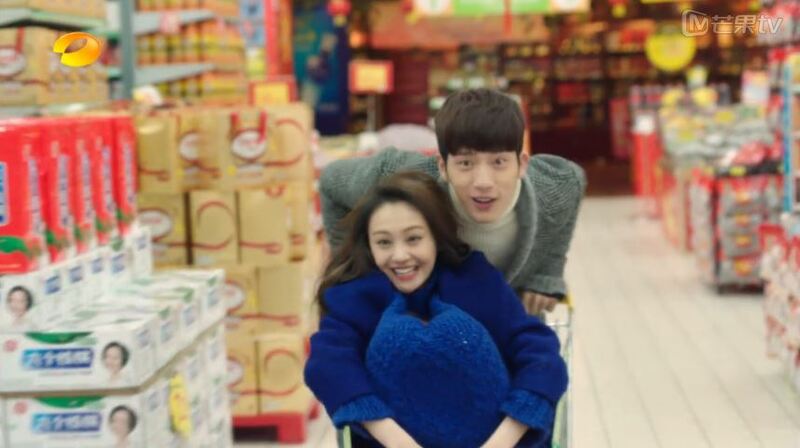 Inspired by her mother’s famous dish of spicy chicken, she goes to the supermarket with Gong Ming. He buys a lot of cup noodles because they are buy one get one free. Cute!!! Xiang Xiang: Do you know what this is? Xiang Xiang: It’s called biiiiggg apple. Different flower have different meanings. For example, lilies resemble purity and roses symbolize romance. Do you know what apple means? Gong Ming: No, I don’t, but it sounds interesting. Did some master say this or did it get passed down through the ages? Xiang Xiang: Well, someone said it. They say that apple means attraction. In the West there is a city called Troy that fought over a golden apple. Also, in Western story, Snow White ate a poisonous apple and died. 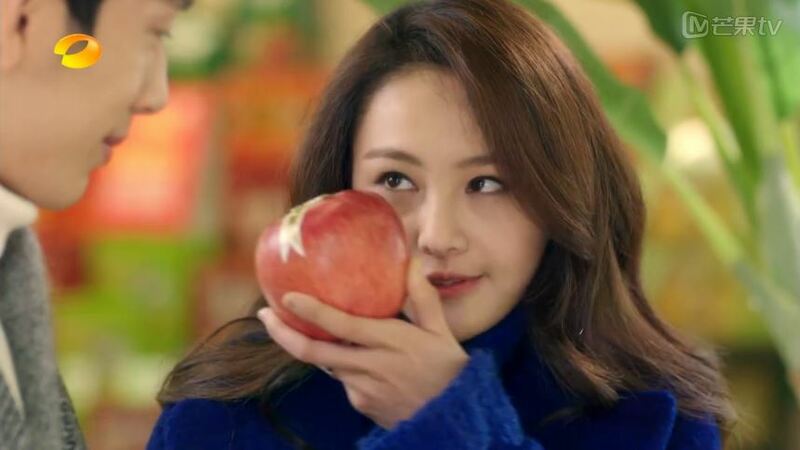 Even though these are Western stories, I want to gift this apple to you. Gong Ming: What does that mean? Xiang Xiang: I’m trying to attract you! Come here, you should gift this to me. Gong Ming: Orange? What does it mean? Xiang Xiang: It represents pure love. Xiang Xiang: Why didn’t you gift it to me?! Gong Ming: Xiang Xiang, what about this? Xiang Xiang: It means boring, totally befitting for you! Xiang Xiang is cooking and Gong Ming is confused why she thinks he should help. Xiang Xiang tells him that being a good cook is a desired trait for men in 2015. Yes, yes it is 😀 But Xiang Xiang doesn’t look like she can cook… And even Gong Ming is doubting her. Gong Ming: Are you sure this is cooked this way? Xiang Xiang: Of course! I just haven’t cooked it in a long time. You know what’s your problem? Xiang Xiang: You are too blunt. You are even more straightforward than me. Girls these days like sweet talk, you need to learn sweet talk. Soon after, Xiang Xiang pretends to burn herself and Gong Ming gets all anxious, but he realize that she is teasing him again. He comments that modern day people are too into lying to each other, and that righteous people shouldn’t do that. She chides that it’s the reason he likes her. Gong Ming learns the tricks and use it right away. He pretends that her chicken is no good and worries Xiang Xiang for a quick second. He explains that now he knows why people play pretend because it is actually really fun! In any case, he does tell her that the chicken is too spicy, and he prefers this other dish over her cooking. LOL. After lunch, Gong Ming suggests that Xiang Xiang teaches him how to wash dishes. While he unties her apron, he gives her a back hug. Awwww! And he tells her that he wants to stay here with her. Gong Ming hides behind a cabinet so he can vanish without being caught on camera. But dude, people are going to wonder how come you never came out from behind the camera. When Ying Yue tells Gong Ming to forget about his proposal, he ask why. Um, did you want to marry her??? Xiao Nan and Jing Jie get into a fight again after he points out her wrinkles and tells Tian Xiu that she has size 40 shoes. 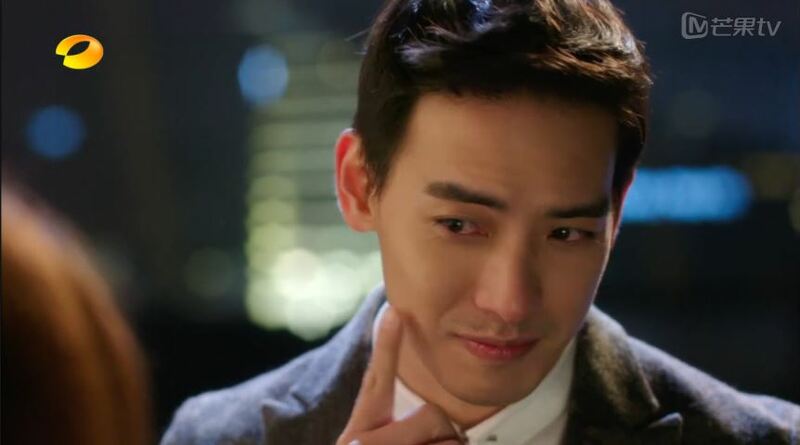 When Xiang Xiang treats Gong Ming’s wounds he confesses that it felt really good to throw a punch for the first time. Wang Mang tries to see the Emperor, but he gets rejected yet again.